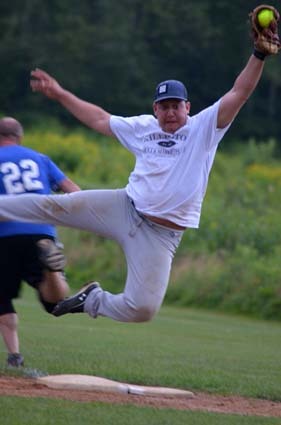 Be a part of a softball team this summer, and get in some hang time like this player did with a leaping catch. Calling all softball players! Killington Softball League is looking for a few good men and women to play some softball. This is a men’s league that welcomes women to play—it is not a co-ed league. Games will start May 18, and are played in Killington and Bridgewater. Please contact Commissioner Dave Hoffenberg at killingtonsoftball@gmail.com if you want to join a team or are interested in forming a team.